When washing leads you to require bathing aids for disabled people, it can become a minefield. There can be so many items to choose from and which would be suitable for your needs is not always easy to discover from scanning a website or catalogue. Here’s a guide to the whys and wherefores of washing if you require some extra equipment, whether you are wobbly on your legs or get around using a wheelchair. For those whose condition is not long term, temporary solutions to bathing for disabled people are the best idea. These can be fitted, and then removed once you no longer need them. You will need to fit a suction handrail to allow you to steady yourself while getting into the bath or shower. You may also need a seat to use while bathing. If you prefer to wash in a bath, a simple flat seat is best, and for showers a seat that attaches to the floor with suction cups ensures a secure washing experience. Luckily these are all very reasonably priced, can be easily stored away and do not cause any damage to the structure of your home. 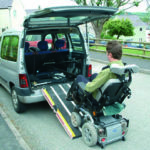 If you’re condition or impairment is long term you might need more permanent solutions. Of course not everyone can make physical changes to their home, and the equipment listed above will work for you too, but if you are planning to adapt your home to suit your new requirements there are some essential elements to consider. When adapting bathrooms for disabled people, there is a world of aids and adaptations available to you. Most importantly you need to find a builder that understands creating accessible bathrooms. The best solution to finding a knowledgeable builder in you area is to contact local disabled people’s groups or charities, and get recommendations. Alongside the advice of your builder, it is important that you have the input of experts such as Occupational Therapists. Don’t forget this is your bathroom, so you should have the final say. Also don’t worry about ending up with an ugly bathroom. Once adapted bathrooms were rather utilitarian, but now they can be as beautiful as those in glossy design magazines. 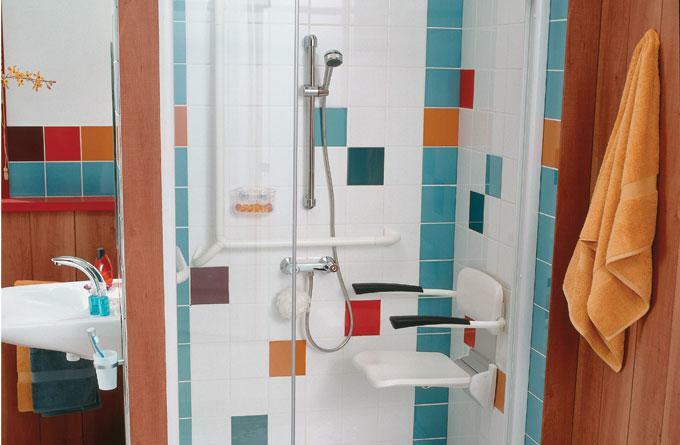 When it comes to adapting your bathroom to suit your disability, there are two key options, a walk in shower or a bath. Many experts advise a shower, but a bath can be a valid solution if you experience chronic pain or spasms, as these can be lessened by bathing in warm water, or if you feel you might slip off a seat in a shower. The best bath to fit is one with handrails at each side, and taps in one corner, the corner that is on the outside of the bath. This allows you to reach the taps yourself if you can, and allows them not to block you when transferring in and out of the bath. If you choose the bath solution, and have the space, a sitting area at one end of the bath opposite the taps will allow you to dry yourself and will make transferring easier. If this is not possible, or you require assistance lowering yourself into the bath then it might be best to use a seating system that will raise and lower you into the water. Many disabled people choose the shower option for their bathing needs and accessible showers can now be stunning pieces of interior design. If you use a wheelchair or have trouble lifting your feet the shower should be level access. You can either use a free standing shower stool, a shower chair with a backrest, which is better if you have trouble sitting up, or a wall mounted seat . Again you may need advice from an expert. You can either go for a wetroom or install glass panels that fold back to allow access. Both can look amazing. Which ever bathing solution you choose, you will need to install handrails to ensure you can transfer easily and to steady yourself while bathing. These should be positioned to best suit your needs, and may require internal supports to be fitted by your builder. Whatever solutions you choose, finding a way to keep yourself clean that suits your personal needs and taste is one of the best routes to recovering your independence and freedom. For more advice on creating an accessible home this website had some great advice, Disabled Gear and to find most of the aids mentioned in this article visit Invacare (http://www.invacare.eu.com/). Good luck.